Chronicling my [late] start racing a Miata in the Spec Miata class and beyond. Lessons Learned Rebuilding & Assembling my Spec Miata's Engine! Originally, I had though that I would write a how-to on building and assembling the engine. However, now that I've gone through the process, I think it would be more helpful to do a write up on lessons learned and tips that will help you avoid some of the complications that I encountered and about the planning process. Reading through the Factory Service Manual will provide you with an excellent how-to on assembling the motor and the order in which to do it. I cannot provide you with any value by re-writing the steps in the FSM. So here goes on Lessons Learned. Cleaning the block and engine parts aka "hot tanking"
I had originally planned on measuring the engine cylinder bores, crank etc myself. Watching videos on Jafromobile's video channel makes it seem pretty easy and straightforward. Until you notice the lengths he has to go through to ensure that the cheap, non-sufficiently accurate tools are measuring accurately. Hmmm... I felt comfortable measuring parts but I hate ambiguity. I'm meticulous and using tools that are not accurate to the level that they need to be would have driven me nuts and made me question everything. I priced out the accurate tools that the machine shops use for this process and found them to be very expensive - like hundreds of dollars for EACH tool. Plus they need to be calibrated and checked to ensure accuracy. While researching measuring tools, I was also looking for machine shops. I asked a few people on local message boards, checked Yelp and used Google to search for reviews for local machine shops. I called a few of the more promising ones. Some don't work on "imports" so that was a surprise.  I stumbled upon Victory Automotive in San Jose through Yelp. Turns out they had done Miata engines before for some local racers which sounded very promising. Inspect the block, measure bores and clean up / lightly machine the top, mating surface of the block. The mating surfaces of a used engine are going to be a bit rough from material transferred from the head gasket. Inspect and resurface the mating surface of the head to ensure it is flat. I also wound up having him rebuild the head which I had originally planned on doing myself. Price all-in for this work was a little over $800 including the head rebuild. It would have been about $250 just for the cleaning, inspection and measuring. If you are researching how to build a motor, you undoubtedly have read various articles and viewed various videos where people mention cleaning the motor. All of these resources make it sound as if the engine parts will be a total mess of machining swarf (aka crap) and fine metal particles when you pick them up from your machine shop (assuming you used a machine shop. If you didn't, then your parts will probably be a bigger mess than mine...). That wasn't the case for me. When I picked up the machined engine parts from Victory Automotive in San Jose, I inquired about what I should do to clean the engine parts. He informed that the parts get cleaned multiple times during the machining process. By the time they are ready for assembly or for a customer to pick them up, the parts are not the nightmare that these stories make them out to be. Yes, they still need to be cleaned and gone through to ensure that no foreign material is hiding anywhere but not as "dirty" as I had been led to believe. I suspect that this might vary depending on the machine shop that you use. Engine Brush kit contained various brushes made of steel, brass and nylon. These were extremely useful to clean the oil and coolant passages in the block especially. 6 piece Detail Brush set was useful for cleaning bolts, scrubbing down the oil pan (inside and out), intake manifold, valve cover, the block etc. I mostly used the steel and brass brushes for those jobs. More wire brushes - These wire brushes were very useful thanks to the little protrusion at the end. Those protrusions get into corners of the valve cover and oil pan more easily than anything else on this list. Ace Hardware has some similar brushes to these. Again, I only used the steel and brass ones. Tube Brush Kit aka Pipe Cleaning brushes were also very useful. 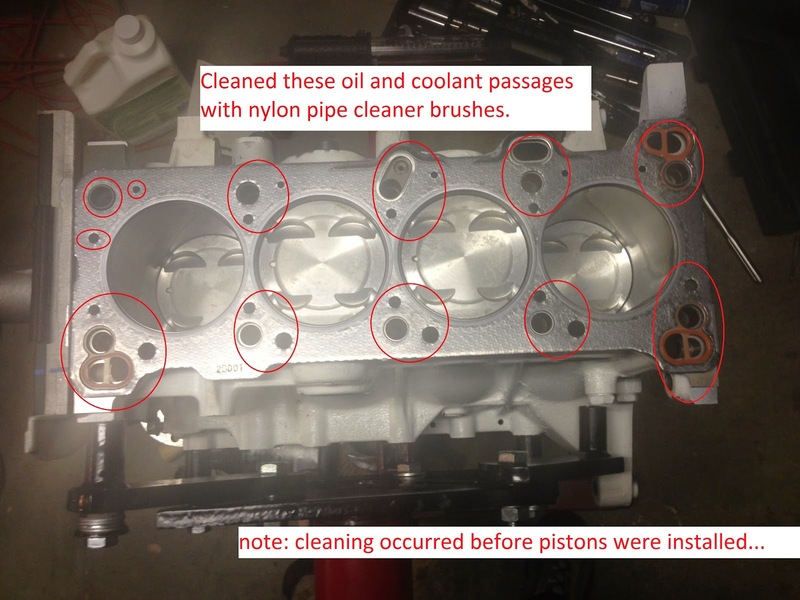 I used the nylon brushes of different diameters to clean the oil and coolant passages on the block, head, crank. These are a lot longer than the brushes in the Engine Brush Kit and the handle is a little flexible so they are easy to bend around the various tight cavities you are trying to clean. The process I used was to spray down the crevice, hole, oil passage, coolant passage etc with carb cleaner and quickly use the brushes to scrub the passages in question. After scrubbing, I'd follow up with by spraying more carb cleaner into the passage using the caustic liquid as a rinse. This is what the block looked like when I picked it up from the machine shop. Nice and shiny and clean looking. They even provided me with the thick plastic bag to store the parts and keep them from getting dusty in between steps of the assembly. Once that was clean, I rotated the block upright on the engine stand and started cleaning all the oil and coolant passages. These passages route coolant and oil to/from the head. I used the nylon Tube/Pipe brush kit for this job with lots of carb cleaner. I attempted to carefully use the brass brushes on some of these passages but it was way to easy to slip and scratch the block surface so be careful if you decide you need to use a metal brush on these passages. Also, note that the image below is being used simply to illustrate the passages/holes that need to be cleaned. I used so much carb cleaner while cleaning that it overflowed down the side of the block and started eating away the black engine paint that the machine shop had painted the block with so that it wouldn't rust (and so it looked nice). I later wound up repainting the block but I wasn't concerned about the paint at this point in time. The only thing I was concerned about was ensuring I had a clean block. I did. 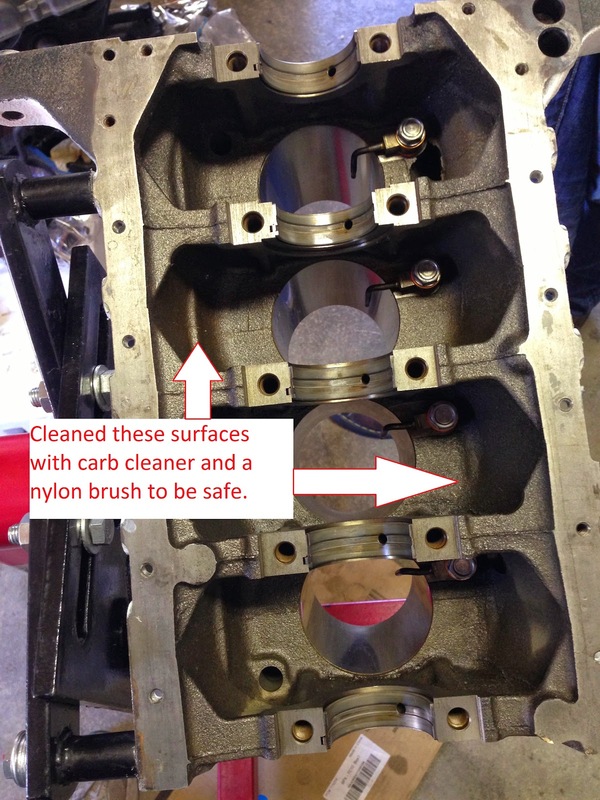 I really didn't see much crap coming out on the brushes or on the carb cleaner rinse which was surprising considering what I had been led to believe about how dirty the block was expected to be. Compared to the block, the crank was indeed dirty. I used carb cleaner and the nylon Tube/Pipe brushes to clean the oil passages in the crank. The white nylon was quickly stained black with whatever machining gunk was leftover in the crank's oil bores. I would spray the nylon brush in between scrubbings to get rid of the gunk in its bristles so that it was as clean as could be before each use. Do NOT use any metal brushes to clean this part! This is way too important of a part to risk scratching! I attempted to use "lint-free" cloths to clean the machined areas (lobes?) that sit on the bearings. Finding "lint-free" cloths that are actually lint-free is difficult. The machine shop uses some special stuff that their supplier provides. Nothing at your local auto parts store seems to actually be lint-free in practice - including the blue shop towels. The blue shop towels are better than Bounty paper towels but not lint-free. The best tip I got for finding "lint-free" cloths came from Jafromobile. He uses coffee filters. Unfortunately, I only discovered that trick after I did the work... I used the blue shop cloths and blew the surface with carb cleaner and then compressed air. Results seemed OK.
First, I used the flat detail brushes and carb cleaner to scrub down the cast iron, non-machined parts of the crank like I did the underside, inside area of the block. Next, I used the pipe cleaners to clean the oil holes in the crank as shown below. Next, I carefully sprayed down the lobes with carb cleaner and wiped down with strips of the blue shop towel being careful not too rub on the abrasive, cast iron sides and create dust balls. I repeated these steps a couple of times to satisfy my paranoia. Cleaning the crankshaft went much faster than the block since it is so much smaller of a part. This was pretty easy. The pistons were in spec so we didn't bother disassembling the piston from the connecting rod since we were re-using them. A few good spray of carb cleaner and some scrubbing with the nylon brushes and they were clean. The piston ring grooves did need a good thorough cleaning as the hot tanking or whatever the machine shop did to clean up the pistons did not remove the dried old gunk that was in the ring grooves. I was a bit concerned about the wear marks on the sides of the pistons but they were in spec and re-usable. Those marks come from the pistons sliding through the cylinder bores in the block. There was nothing special about cleaning the head. I used the Tube/Pipe brushes and carb cleaner. After cleaning the block and crank, I was starting to get more comfortable with the realities of cleaning these parts. Thankfully, the machine shop did a great job of cleaning all the parts before handing them back to me. The machine shop found that the original valves and valve springs were still in spec, so they were re-used. The valves were cleaned and lapped. 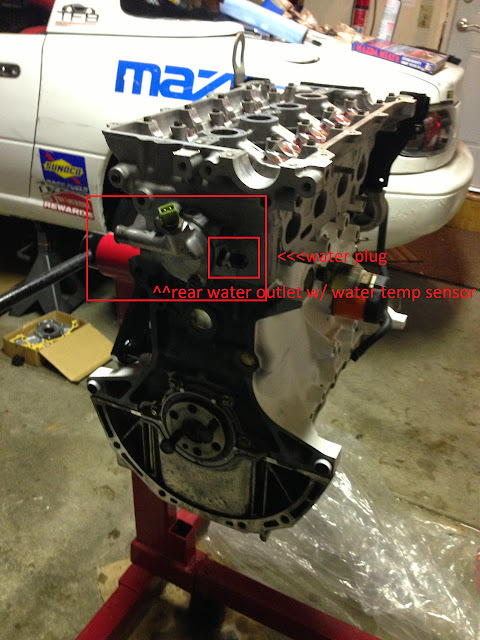 I provided the new valve seals sourced from Mazda Motorsports. Some pics of the clean head below. Closer look into the intake port and view of the valves. Nice and clean! This is what the coolant passage inside of the head looked like before being cleaned at the machine shop. After cleaning anything and stopping for the day, I would place it back into the plastic bags that the machine shop had provided me with to store the parts during the build. As you noticed in my prior blog posts, I ran into some complications during this project. I should have just sourced a crank from another motor. A local Miata club member had offered me a "Big Nose" crank shaft for $50. I should have sourced a big nose crank and the associated pulleys from the start. It is a much more robust design. Service procedures and manuals change over time. It was helpful to have both the 1990 FSM, 1991+ FSM in PDF form and a really early edition of the Enthusiast Manual in print. The one section of the newest FSM that the guys at Mazda Motorsports sent me was helpful to address the piston ring orientation issue. The latest FSM actually covers all years 1990-2005 so it can get confusing if you are using it for an early engine since things like whether the oil pump uses a gasket or sealant change from the 1.6 to early 1.8 and later 1.8 engines. The Hayes manual that my friend had was helpful to refer to a couple of times but even that had some discrepancies - like with the piston ring orientation issue. I recommend you stick with the 90 or 91 FSM and perhaps an Enthusiast Manual or Hayes in printed form. There are few things you want to do before starting with the bottom end (crank and pistons) so that you don't get interrupted. Get your Plastigage ready. Have your torque wrench, sockets and Piston Ring Compressor ready. Have your FSM with Torque specs readily available. Have your Pistons assembled w/ rings ready to go. Have your bearings unboxed, cleaned, lined up and ready to install. Install the oil squirters with crush washers into the block and torque to spec. With the above ready, I was finally able to start assembling the motor. The motor actually goes together rather quickly when you don't get surprised by undocumented things and have things ready to go. Plastigage is an important tool used to check clearances when assembling the motor. It is an interesting "tool" that I had never heard of until undertaking this project. Here is some info on it using Plastigage. The green Plastigage has the sufficient range needed for checking clearances on the Miata's motor. One package is more than enough. I think I sourced mine from Summit or Jegs. Assuming tolerances are good, you can proceed with assembly. This means you add assembly lube to the crank and main bearings and torque them to final spec. From here you can proceed with checking the clearances of the Piston's Connecting Rods when assembled to the crank. The FSM has the procedure but it's basically the same as the crank. Assemble the connecting rod bearings to the connecting rods dry, add Plastigage, torque to spec, unbolt, check clearances, if OK, add assembly lube and torque to spec. The purpose of all this is to determine if there is the appropriate amount of space between the bearings sitting in the block and the crank lobes. This space is where the oil will be circulating to lubricate the crank as it spins. If the Plastigage shows that the clearances are out of spec, there might be a problem with your parts. Considering that the machine shop had already measured the parts when they had the parts, I was pretty confident everything would fit but I still had to follow the steps to verify for myself and make sure a mistake wasn't made up to this point. You must do this dry as if you use assembly lube or oil, the space will be occupied by that lube or oil. The main caps are numbered and must be used in the correct location. The caps will be stamped with a number and the FSM has the correct locations. Another important note - DO NOT ROTATE THE CRANKSHAFT while doing this. Since there is no lube, you will damage both the bearings and the crank. As hoped, the clearances were within the range specified in the FSM. I found that most of my clearances were toward the max allowable which I suppose is to be expected of a 25 year old motor with 180k miles on it. The clearances between the crank and main bearing caps were slightly bigger than .002" but smaller than .0015". This means that the clearances are little "loose" - i.e. toward the wider end of the oil clearance tolerances as specified in the FSM. "Looser" is supposed to be better for use in a normally aspirated race engine since it allows more oil across the bearing - so lower drag/friction and more lubrication and less heat (b/c there is more lubrication). I used some cheap, generic house brand 5w/20 dino oil from O'Rielly's to lubricate the rings while installing into their home in the pistons. 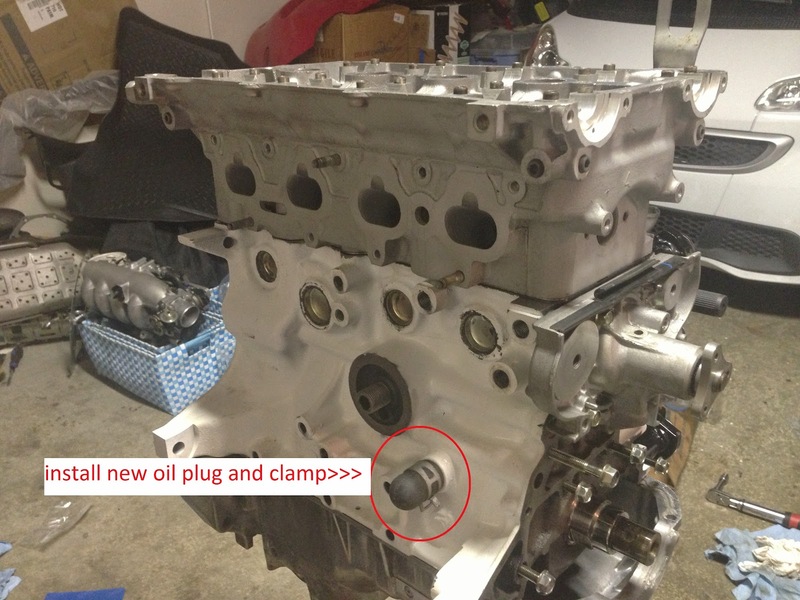 I used the same oil to lubricate the cylinder bores in the block rubbing it in with my hands. After researching this online, I used oil rather than assembly lube on the piston rings and cylinder bores since assembly lube is considered to be too slick. The piston rings need to "seat" against the cylinder bores in the engine block. This requires that they "wear in" a little so you don't want something super slick like assembly lube or synthetic oil. Cheap, light, dino engine oil seems like the way to go. Following the FSM, you'll want to compress the piston rings using the piston ring compressor so you can lower the piston into it's bore. This was actually more difficult than it sounds. I used a cheap ratcheting piston ring compressor. While it ratchets down and compresses the pistons, the rings move around and the orientation gets screwed up. It took more than a few tries to figure out how the ring would move so that I could position the rings in a location where they would eventually wind up in close to the appropriate location. Next time I'll use a better piston ring compressor. I suggest you learn from me and start with a better piston ring compressor. Flyin Miata has one specifically for the Miata's piston sizes. Anyway.... Once you have this figured out, eventually you'll get the pistons in their respective cylinders and you can install the connecting rod bearings, get the Plastigage in place, torque to spec, unbolt the caps and check clearances again. Assuming clearances are fine, you'll lube the bearings with assembly lube and torque to spec. Here is a pic of the bearing fitted into the connecting rod for a visual. Note: The pistons are numbered as are the connecting rods. They are supposed to go back into the same cylinders they were removed from. The FSM has details on this. At this point, you'll be ready to flip the block over and start attach the head. I needed to replace all the freeze plugs on the block. I sourced them from Mazda Motorsports. I put a dab of the grey silicon that I used on the oil pan around the perimeter of the freeze plugs and drove them into the block using a socket and a hammer. The oil galleys also have 2 freeze plugs type things. Best to refer to the FSM for this info. The head goes on surprisingly easy. The only thing to look out for is the head gasket. It can be installed incorrectly. Carefully place the head on top of the head gasket making sure you don't move the head gasket. Then locate the head bolts, lubricate per the FSM and torque to spec in the order specified in the FSM (inside to outside in steps). Next, install your HLAs. I decided to get new ones since the existing HLAs failed the test procedure in the FSM. Some would not compress through their entire range. Pretty bad. I liberally lubed them with assembly lube as you can see below. Don't forget to install a new coolant cap on the coolant port on the rear of the head. I packed mine with high temp silicone so that it would not slip off. It dried for a few days before being exposed to fluids once the engine was installed in the car. This "cursed" plug is near impossible to reach once the engine is in the car. Install the rear water outlet with the factory temp sensor. You can now install the cams, cam seals, cam angle sender. The caps to attach the cam are numbered. Follow the procedure in the FSM to tighten them down to the appropriate torque and use lots of assembly lube. The FSM calls for a bit of silicon to be used at the front cap. Be sure to clean the groove of the cam seal after torquing that cap to get rid of any extra silicone that might have seeped through. I used the Flyin Miata cam seal installation tool which made installing the cam seals easy. This is the easy part but there are a couple of tricky bits that I'll highlight. The FSM can easily walk you through the best procedure for installing the oil pump, water pump, pulleys brackets etc. As noted previously, I got a new oil pump for my engine. It installed easily but there was an unexpected glitch... The oil pump has a hole in it for when the engine is used in a FWD application. This hole needs to be plugged. The new oil pump did NOT come with this plug so I punched it out of the old pump with a screwdriver and a couple of light taps with a hammer. I added some black silicone to it and pushed it back into it's home with a couple of light taps with a hammer. Some of the later oil pumps are designed to not use a gasket. These oil pumps have a groove machined into the mounting flange in a manner similar to the oil pan. I don't even remember seeing a groove and since a gasket was supplied in the Mazda gasket kit, I wound up using it. No leaks so far (it's been a year now). There is also an o-ring that should be installed at the entrance to the block so do pay attention to the FSM but also keep in mind that the parts have changed over the years so you may need to either get silicon or an o-ring. Here it is installed. Note that the new oil pump has the front main crankshaft sealed already installed so you won't need to install the one that came in the Mazda gasket kit. Just make sure to lube the seal liberally with oil so you don't damage it during install. You really need to clean the oil pan well in order for it to seal properly. Do this well in advance of engine assembly as it is time consuming. The oil pan flange has a groove machined into it to capture and hold the grey silicone that is specified for sealing the oil pan. No gasket exists for the oil pan. Here are a few pics during the cleaning process. I used some mineral spirits to scrub the old gunk off and hosed it down with the garden hose, rinse, repeat. The oil pan is aluminum so it's no problem to use water to clean it since it won't rust like the block and crank. This is the old sealant that you need to remove. I started by scraping the flange with a scraper tool (from Harbor Freight) and then used a pic and wire brushes to get the old, dried silicon from all the nooks and crannies. This thing is awesome for removing old silicon from the mounting holes. Do the same on the block if needed. Eventually, I had a clean oil pan. I re-attached the baffle you see in the first pic and this was ready to be bolted back to the engine block. This wire brush was very helpful in cleaning the old dried gunk from all the corners of the pan. There are various discussions about which color silicon sealant to use on the oil pan but nothing really on why to use black vs grey. Through lots of googling one day, I learned that the grey is good to use in applications where vibration is likely to take place - like an oil pan - which is probably why the FSM specifies grey. Beyond this, the rest of it is straightforward and I didn't experience many issues that weren't covered in the FSM. Install timing belt pullies. I got new ones. Install new timing cog and new key on crankshaft. Now we can install the timing belt. I re-used my old one since it was replaced 2 years ago and was still good. Use the fancy Flying Miata tool to hold the camshafts in the correct place during the timing belt install. This thing is awesome. Install new rear main seal - after cleaning the original of course. Install new oil plug and clamp. I used black silicone on this one too and let it dry prior to exposing to fluids. Install the oil pressure sender, oil filter, alternator bracket and position the new gasket for the intake manifold. Installed and torqued the intake manifold that I cleaned up. Installed and torqued fuel rail with my cleaned injectors. Note how the tensioner / adjuster for the alternator installs. Bolted up the attachment points for the engine hoist. You'll notice that I have not yet installed the valve cover. There is a reason for that. I didn't want my super custom paint job on the valve cover to get scratched. I fixed the drips you see in this pic in a later coating of paint. Using VHT engine block paint for this. I used a spare valve cover for the engine install and installed the valve cover after the engine was in the car. I think that about covers it. Hope this post helps you if you are planning on rebuilding your own engine. I first ran the car up to ~180* temps using regular dino oil. I installed the OE 192* thermostat for this. I used Shell Rotella 15/40 diesel oil since some people had recommended it due to the high quantity of ZDDP. That was not a good choice for this engine as the HLAs made a ton of noise - which wasn't helped by the fact that I had not soaked the HLAs in oil prior to install. I should have used cheap 10/30. I dumped that oil and filled it up with 4 quarts of Joe Gibbs break in oil in 30 weight and a Wix filter. From there I drove it on a deserted street near my house at night for a few miles following the Flyin Miata engine break in procedure which was similar to what a lot of guys on MazdaRacers forum had recommended. I took the car to a track day and ran 5 20 minute sessions in a day in a manner similar to the Flyin Miata procedure. Then I dumped that oil, filled it with Valvoline 30 weight dino racing oil and hit the dyno. The car dyno'ed 117 RWHP in the first couple of pulls on the chassis dyno which is more than I needed to meet the 113-115 RWHP max limit for the Sealed Spec Miata class of San Francisco Region SCCA. After some tuning, Kevin at MCE was able to get the power down and seal the car. The question that I've been asked the most by the local guys that know I built my motor is - would I do it again. I think I would. Especially now that I know what the complications are. It will take me far less time the second time around. I still need to add up costs but they seem to be a less than $2k all in. Contact me if you have any questions. Thanks for reading. copyright = me. Awesome Inc. theme. Powered by Blogger.